Powdery mildew and Botrytis cinera infections remain among the most plant pathological problems worldwide both in agriculture and horticulture. While they are two separate diseases they often go hand and hand by being considered aggressive pathogens in cannabis cultivation. Powdery mildew has shown to be an aggressive fungus and has been referred to as “plant herpes” or “opportunist” because of its ability to manifest during levels of stress from its host plant. The white powdery substance is a recognizable infection of powdery mildew and it is extremely frustrating to growers to treat it and implement preventative care. Powdery mildew has many species and each species attacks different plants. The species that infect Cannabis are restricted to hemp, hops and a limited number of host plants. Botrytis on the other hand attacks over 200 plants worldwide and is a necrotrophic fungus that is also commonly found on cannabis. It has been commonly referred to as “budrot” because of its ability to develop inside the dense cores of the cannabis buds and then spread outwards, making it very difficult to detect in its early stages. It is often seen as grey, white, brown or rust colored mold with hairs on the inside of the bud. When proper conditions are optimal such as poor air circulation, high humidity and dampness, Botrytis can propagate to the point that it attacks leaves, stems, and seedlings. Just like powdery mildew Botrytis can reproduce sexually and asexually and its spores can be transported through the air and can come into contact with the leaves or stems of the crop. Other means of spore travel are insects, splashing water, and nearby crops that are also infected. In the case of powdery mildew (pm) this has been an ongoing debate. Does the pm infection spread internally throughout the whole plant or does it create a mycelium network on surface of the leaves? 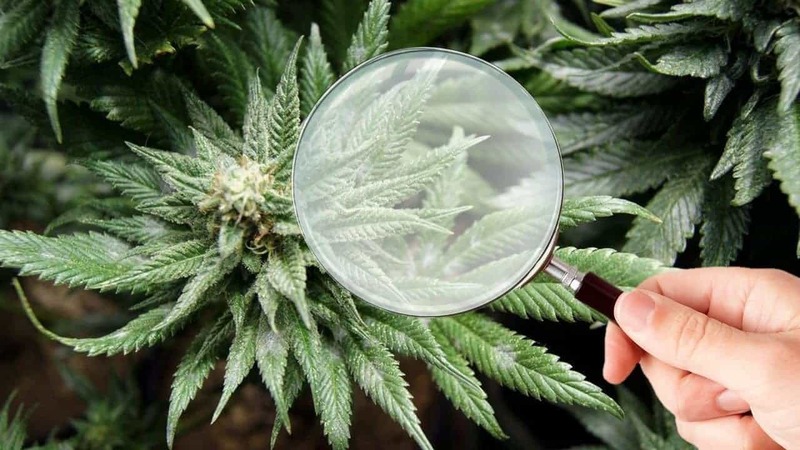 Great research has been conducted at Medicinal Genomics on identifying the novel pm species on cannabis but there has not been enough science literature to validate on how the pathogen behaves on the host. Botrytis however is a systemic pathogen and has been stated to be a seed-borne parasite based on research (Colhoun & Muskett 1948). In many cases it has been observed that the pathogen and the seed are in a near symbiotic state during seed dormancy. Once germination is initiated the pathogen becomes active and either kills the seed or cause serious infection of the developing seed. This significant damage is the result of a pre-existing infection and it can be internalized over extended periods during the phase of plant growth (Maude and Presly, 1977; du Toit et al…2004). Foliar sprays are a common preventative treatment for both powdery mildew and Botrytis. Organic fungicide can contain sulfur or they can be inoculated with beneficial microbes such as Trichoderma harzianum and Bacillus subtilis. These two beneficial microbes have been shown to prevent and treat outbreaks all the way up until harvest as well as form a symbiotic relationship against other fungal pathogens. Neem oil, potassium bicarbonate, and milk are other forms of treatment but more effective in suppressing powdery mildew infection. Bio-priming is a technique that treats seeds by inoculating them with a beneficial organism (bio-control agent) to protect the seeds from pathogens. Seed priming technique has been used in commercial and horticultural crops and has shown to improve the growth of seedlings. Incorporating a bio-control agent into the priming process is a great alternative method for prevention against seed and soil borne diseases. The bio-control agent is applied over the seed surface as a protective coating all around the seed. The process is very simple and it mainly involves soaking the seed in water and an incubation period. 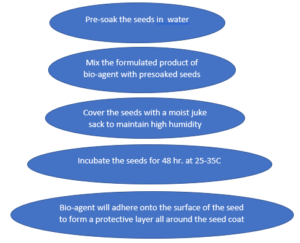 Depending on the bio-control agent being used there are 5 different modes of actions that helps protect the seed thus establishing a symbiotic relationship. Mycoparatism– the paratism of one fungus by another by forming a physical barrier, production of cell wall degrading enzymes, or production of antibiotics. Nutrient Competition – Competition between microorganisms for carbon, nitrogen, oxygen, and other nutrients. Antibiosis – Inhibition of one organism by another as a result of a diffusion of an antibiotic. Volatile Compound Production – Production of volatile compounds such as lactones, alcohols, and terpene derivatives of pyran which inhibits specific mycelial growth. Enzyme Production – Extracellular enzymes such as chitinase and glucanases that degrade the cell walls of pathogens. Seed bio-priming can provide increased levels of protection against seed and soil-borne pathogens. In addition, it can also help create an optimal condition for plant health and growth. Growers should be more encouraged to adopt this method as it is a safe organic technique to protect your plants.